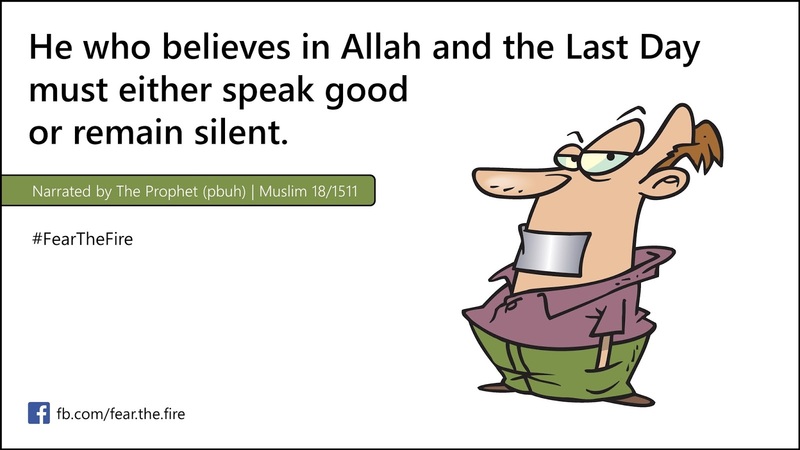 Islam today is perceived as an extreme religion. Little do people know that Islam forbids all kinds of evil and guides Muslims to be away from all sorts of immoderate activity (viz. excessiveness, hairsplitting, pedantry, fanaticism) and provides guidance on all walks of life so that there is complete harmony in society. 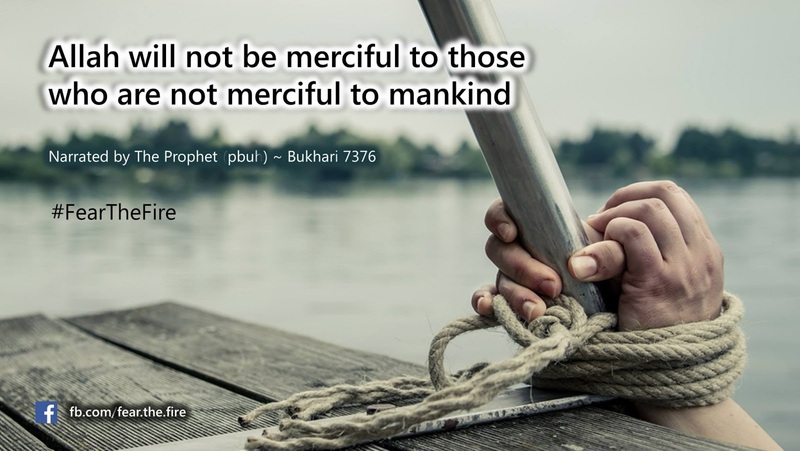 The teachings of Quran & The Prophet (pbuh) touches all parts of human life, and applies even in the 21st century. 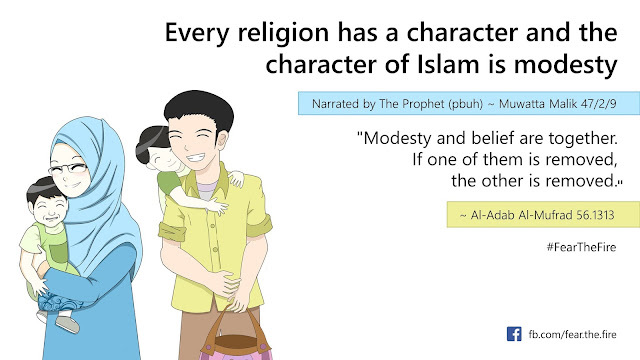 A true Muslim is modest, upright, moderate, fair, has equity and balance in both religious as well as worldly dealings. Click here to know about the character of a Muslim. The Prophet (pbuh) said, "Do not be extremist in your religion" ~ Bukhari 39 | Muslim 2816. 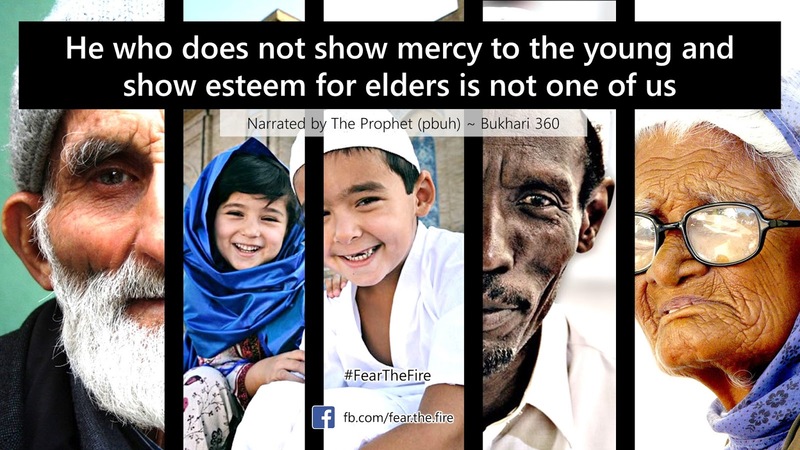 This post attempts to demonstrate different shades of extremism. 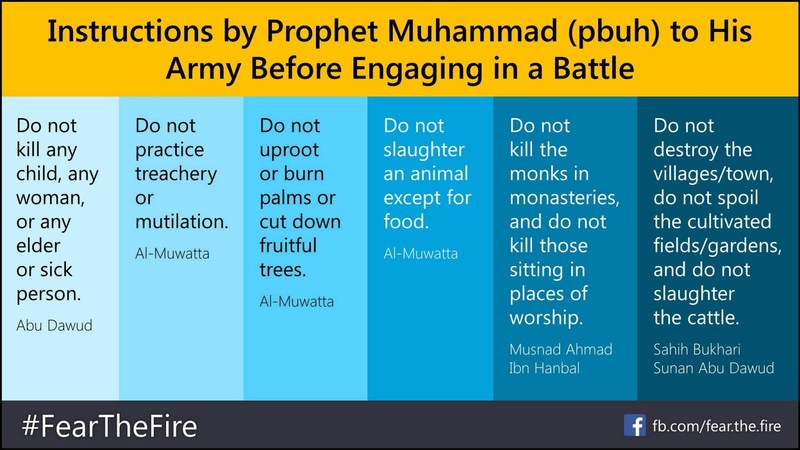 Islam prohibits extremism in all forms. 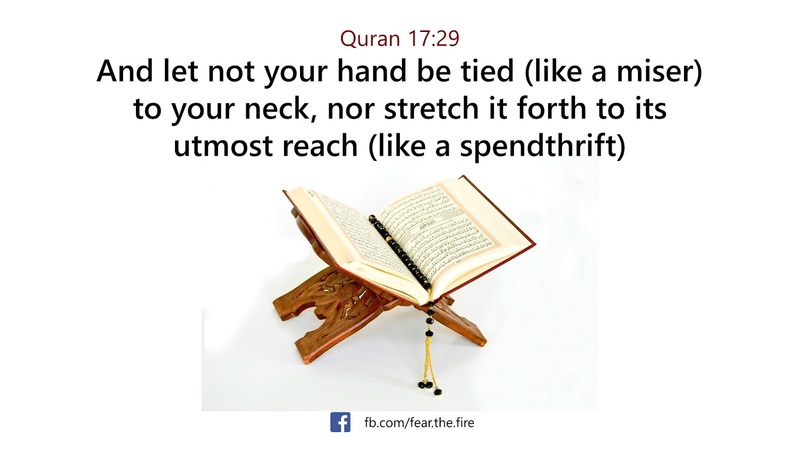 In terms of wealth/money it may mean hoarding wealth or spending too much. 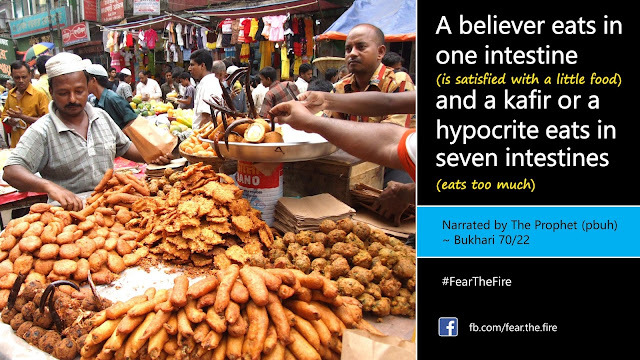 In terms of food it means overindulging too much or eating extremely little which affects one's health. In terms of family, it would mean neglecting the family and caring too much about others. 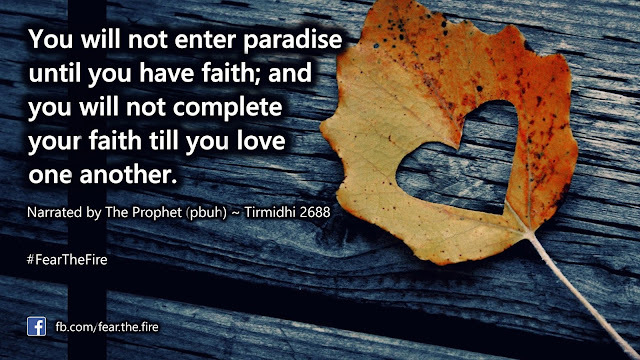 Whatever the situation may be, a Muslim is expected to take a middle path and be moderate in all their worldly dealings. 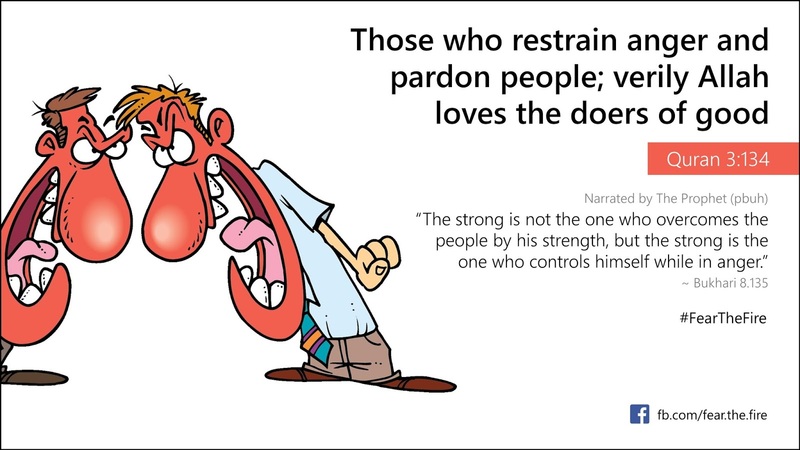 What's outlined below are the select few areas where a believer is supposed to exercise restraint based on the teachings of The Quran and Prophet Muhammad (pbuh). 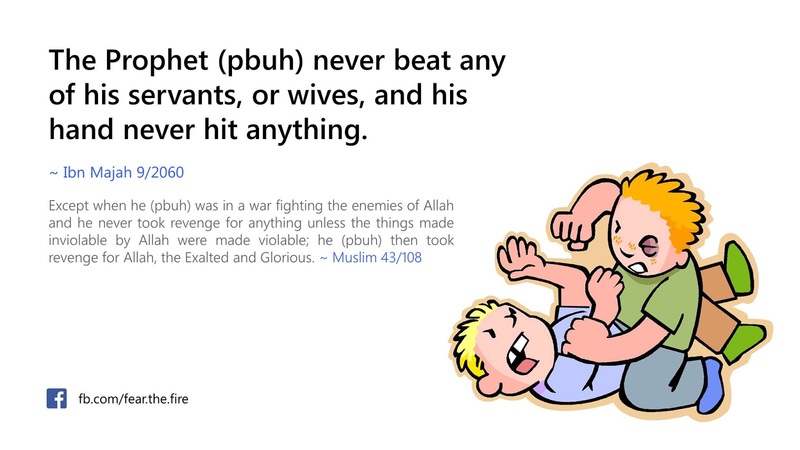 Quran 5:32 ~ If anyone killed a person, not in retaliation of murder or to spread mischief in land, it would be as if he has killed all mankind. And if anyone saved a life, it would be as if he saved the life of all mankind. 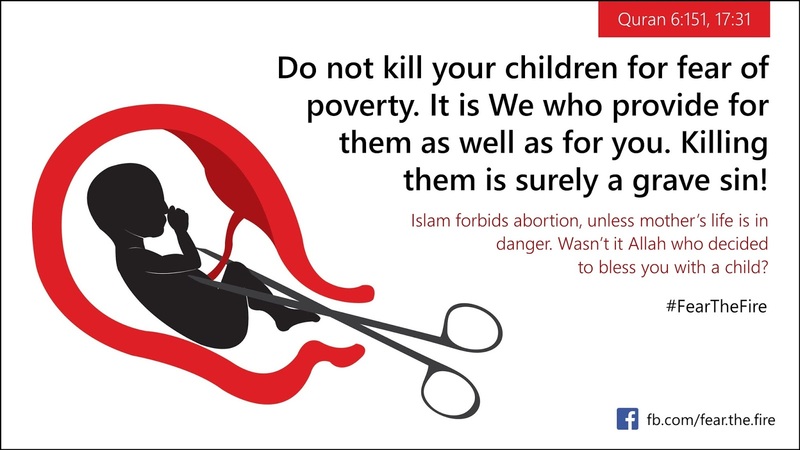 Quran 6:151 | 17: 31 ~ Do not kill your children for fear of poverty, It is We who provide for them as well as for you. 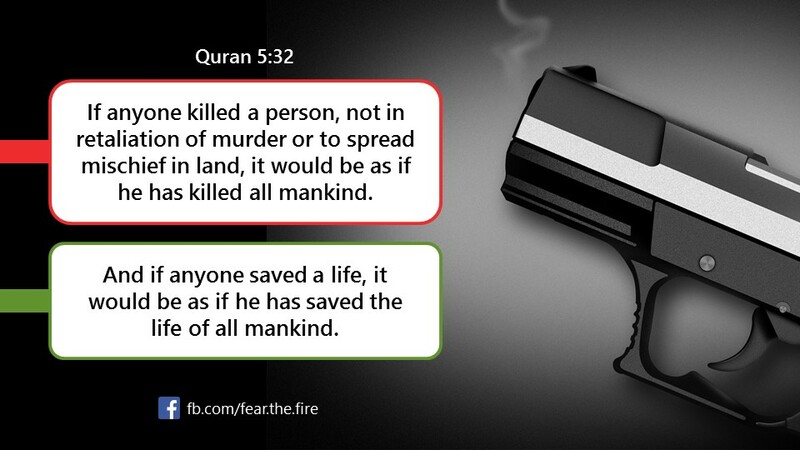 Killing them is surely a grave sin. 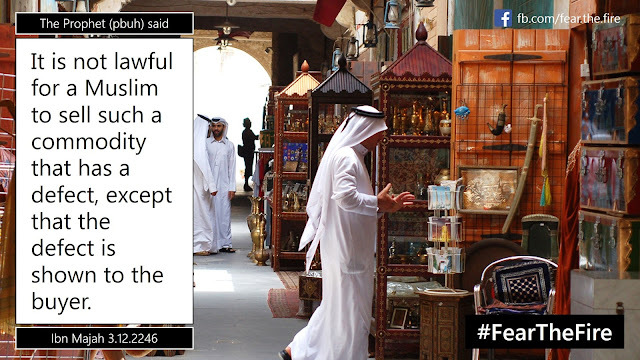 Click here to read how Non-Muslims were protected and flourished in Islamic history. 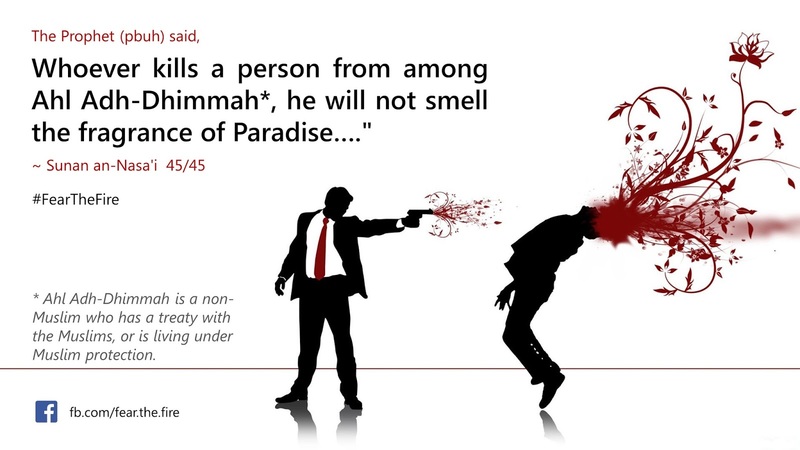 The Prophet (pbuh) said, "Whoever kills a person from among Ahl Adh-Dhimmah, he will not smell the fragrance of Paradise." 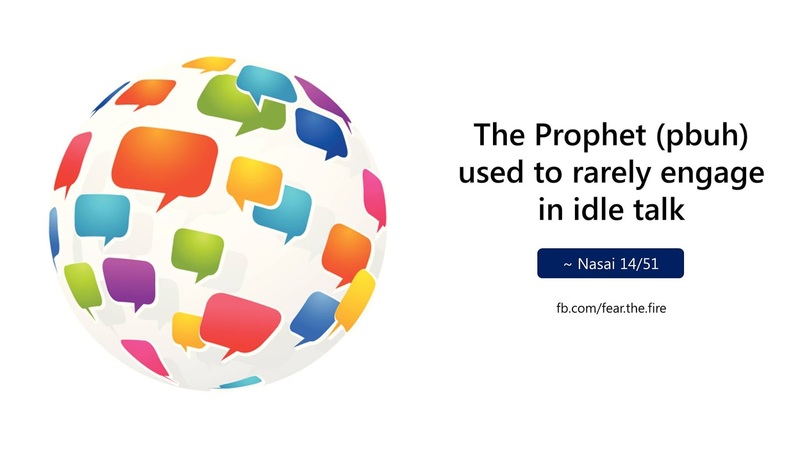 ~ Nasai 45/45. 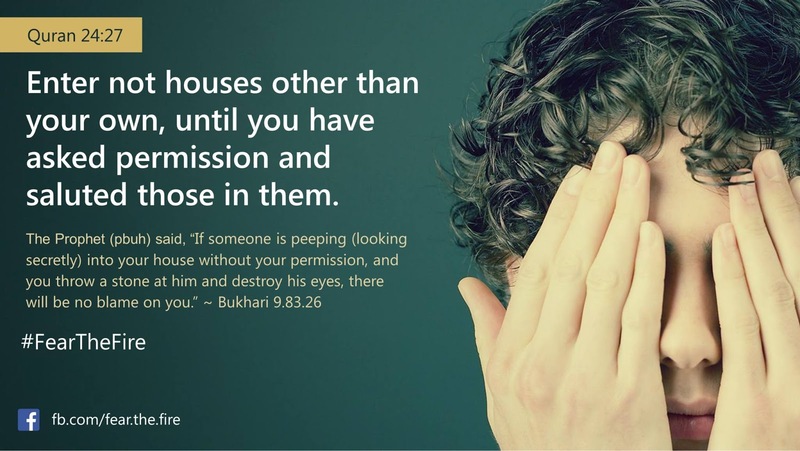 Ahl Adh-Dhimmah are non-Muslims who are living under Muslim protection. Quran 6:108 ~ Do not insult those whom they worship besides Allah. 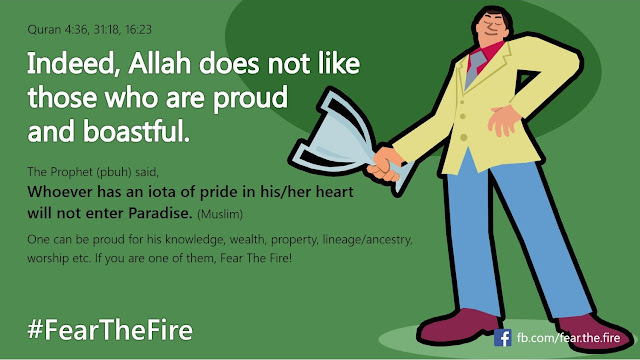 Quran 4:36 | 31:18 | 16:23 ~ Indeed Allah does not like those who are proud and boastful. On the contrary a Muslim is highly recommended to be modest and humble. The Prophet (pbuh) said, "Modesty and belief are together. 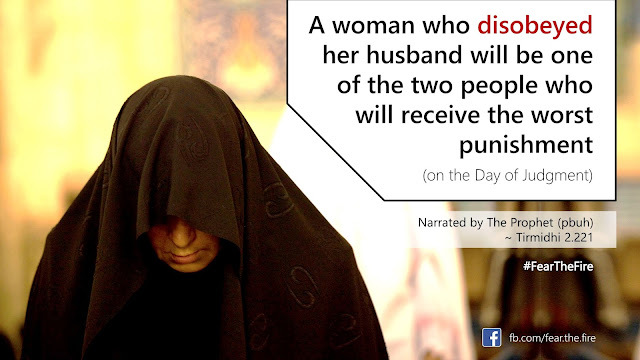 If one of them is removed, the other is removed." 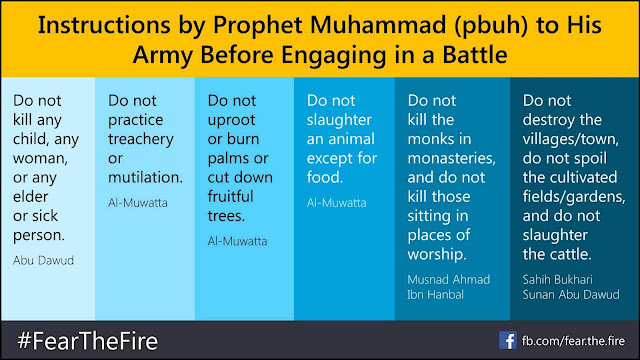 "Do not kill any child, any woman, or any elder or sick person." ~ Abu Dawud. 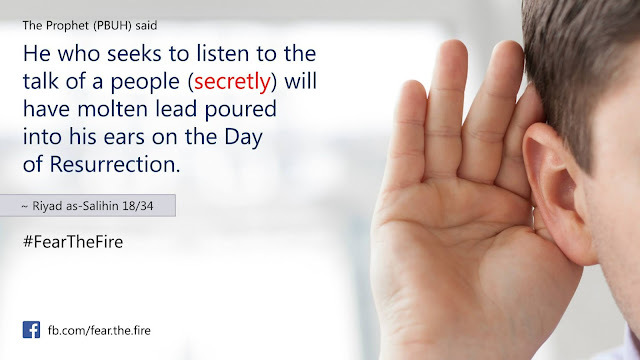 "Do not practice treachery or mutilation." ~ Al Muwatta. 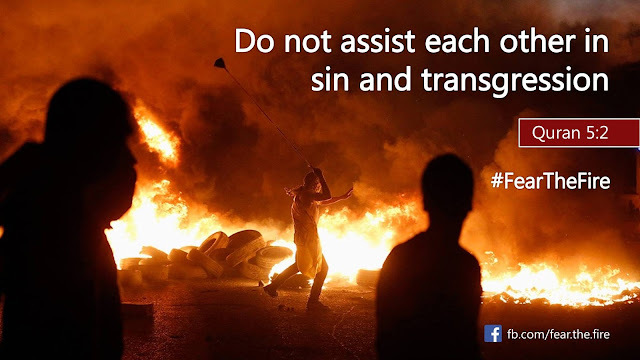 Quran 5:2 ~ Do not assist each other in sin and transgression. 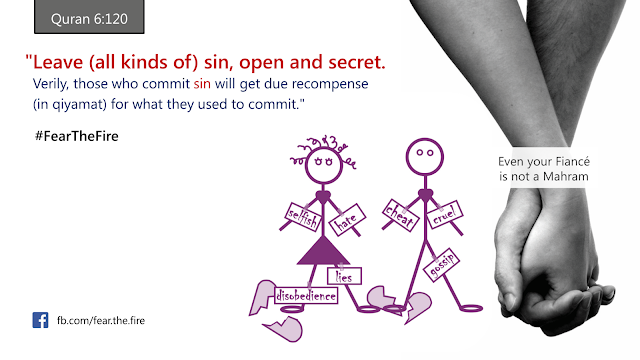 Quran 6:120 ~ Leave (all kinds of) sin, open and secret. 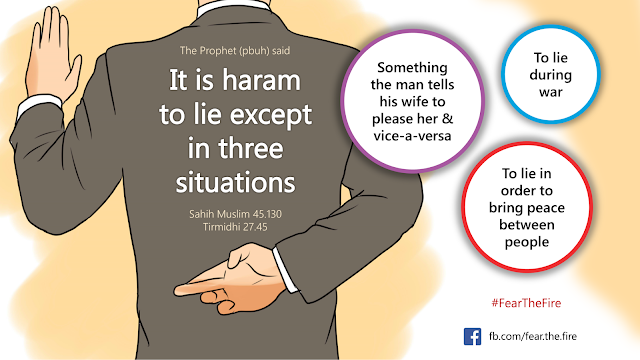 Verily those who commit sin will get due recompense (in Qiyamat) for what they used to commit. Quran 7:31 ~ "... and eat and drink but waste not by extravagance. 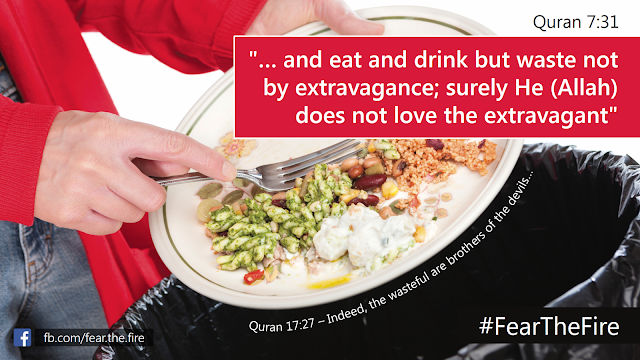 Surely He does not love the extravagant." In addition to the above 1/3rd rule, another hadith indicates the difference between a person who eats less vs who eats full stomach. The Prophet (pbuh) has equated those who eat stomach full with Non-Muslims or hypocrites. And Quran 4:145 says a hypocrite will burn in the lowest depths of (hell) fire. See #10 here. 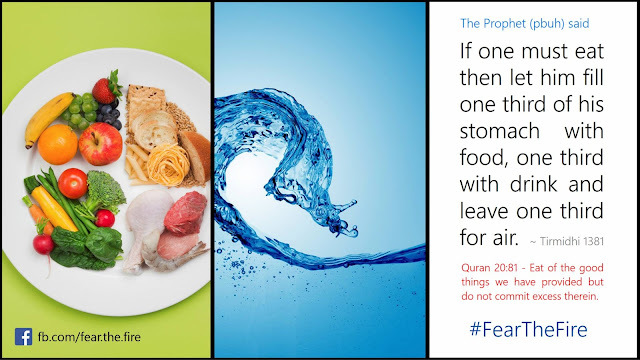 The wisdom behind not eating full stomach is that it saves the believer from unwanted diseases or sickness, particularly obesity which leads to high BP, diabetes, heart problems and others. 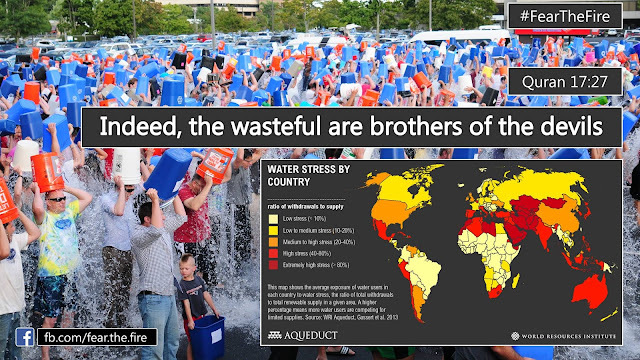 Quran 17:27 ~ Indeed, the wasteful are brothers of the devils. Quran 3:134 ~ Those who restrain anger and pardon people, verily Allah loves the doers of good. 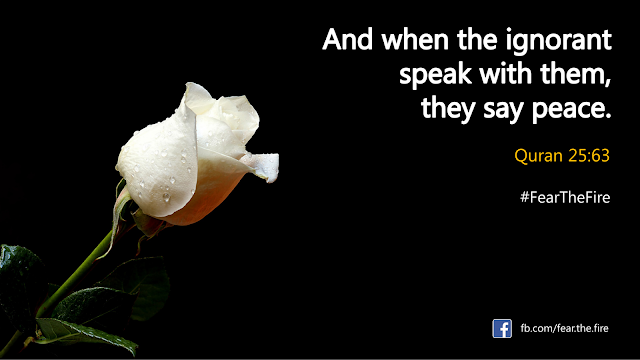 Quran 25:63 ~ And when the ignorant speak with them, they say peace. 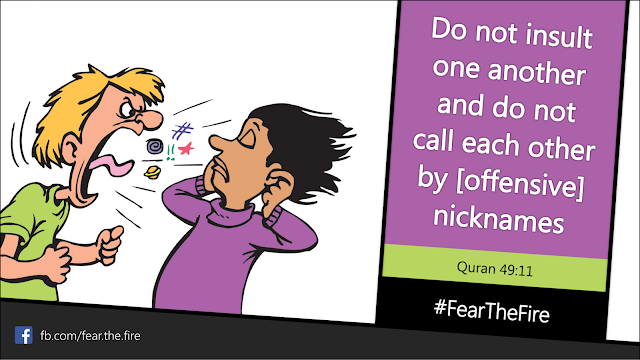 Quran 49:11 ~ Do not insult one another and do not call each other by (offensive) nicknames. The Prophet (pbuh) said in his last sermon, "An Arab has no superiority over a non-Arab nor a non-Arab has any superiority over an Arab. 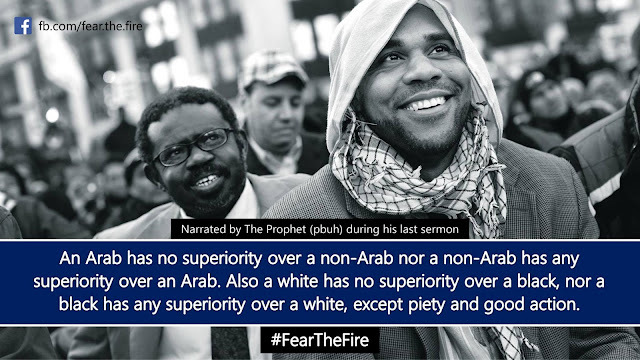 Also a white has no superiority over a black, nor a black has any superiority over a white. 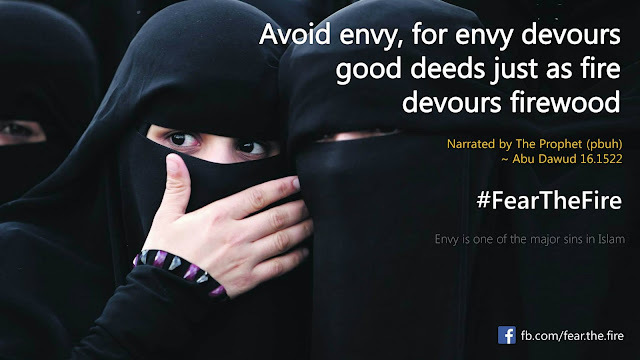 Except piety and good action." Quran 24:27 ~ Enter not houses other than your own, until you have asked permission and saluted those in them. 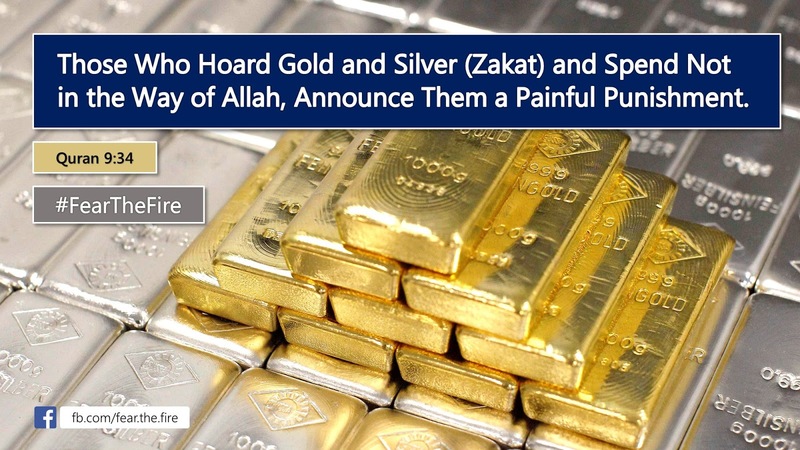 Quran 9:34 ~ Those who hoard gold and silver and spend not in the way of Allah, announce them a painful punishment. Quran 17:29 ~ And let not your hand be tied (like a miser) to your neck, not stretch it forth to its utmost reach (like a spendthrift). 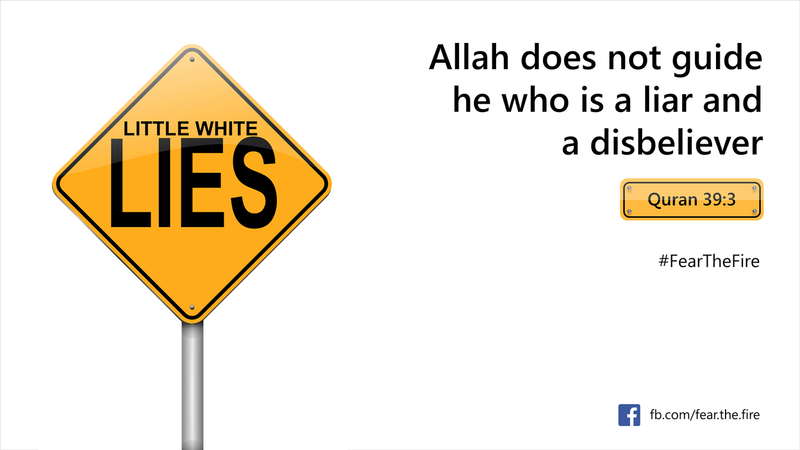 Quran 39:3 ~ Allah does not guide he who is a liar and a disbeliever. 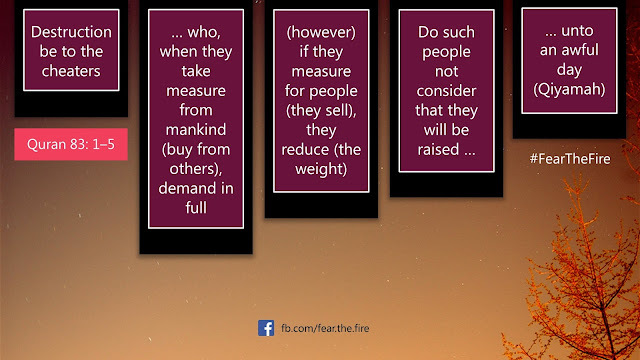 Quran 83:1-5 ~ Destruction be to the cheaters, who when they take measure from mankind demand in full, (however) if they measure for people (they sell), they reduce (the weight). 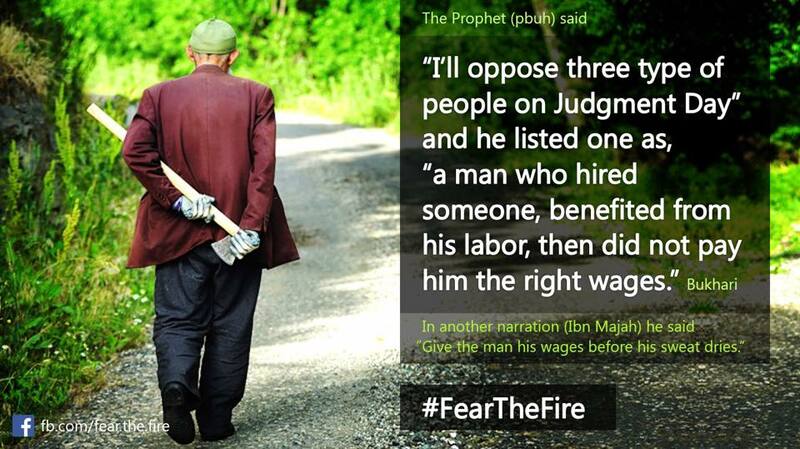 Do such people not consider that they will be raised unto an awful day (Qiyamah)? There are some fundamental rules, or underlying principles, for doing business the way Allah commands and The Prophet (pbuh) has taught. Don't forget to read our exclusive post on The Don'ts of Doing Business in Islam. 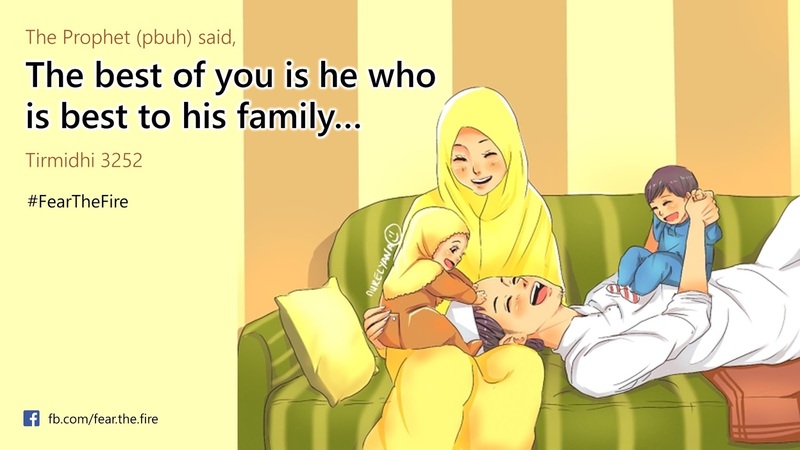 Our post on The Ideal Muslim Husband covers obligation of husbands towards their wife and the post on The Status of Women in Islam describes the how a Muslim is commanded to respect women around him. 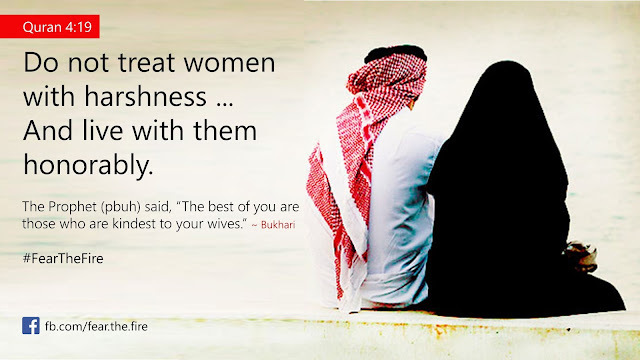 Quran 4:19 ~ Do not treat women with harshness ... and live with them honorably. Click here to read our post on the accursed women in Islam. 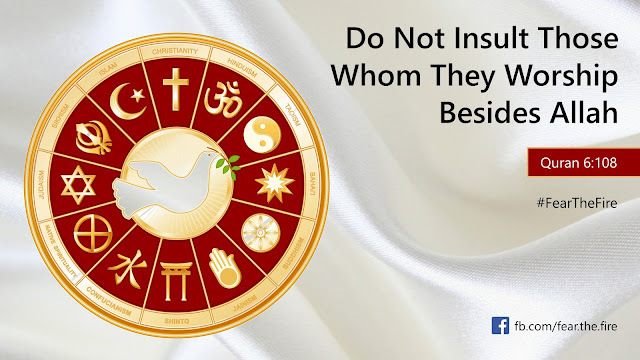 Click here to know more about the rights of your neighbor. 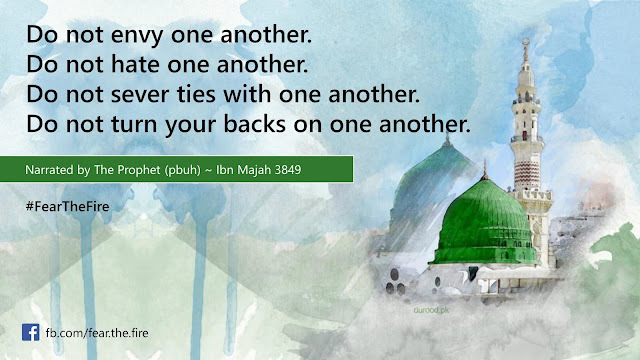 Also note that cutting of ties with your relatives is a major sin in Islam. 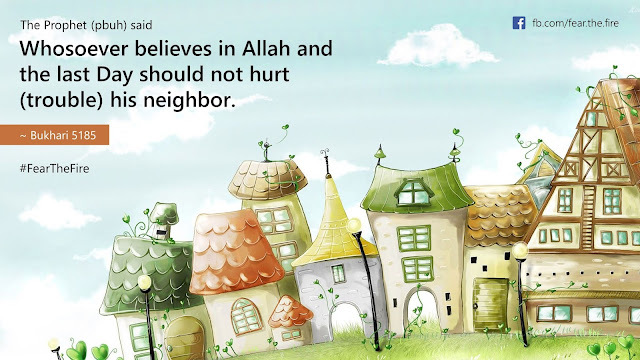 Quran 4:36 ~ be good to your neighbor and the neighbor who is farther away. Quran 4:10 ~ Those who unjustly eat orphan's property ... they will be burnt in the blazing fire! 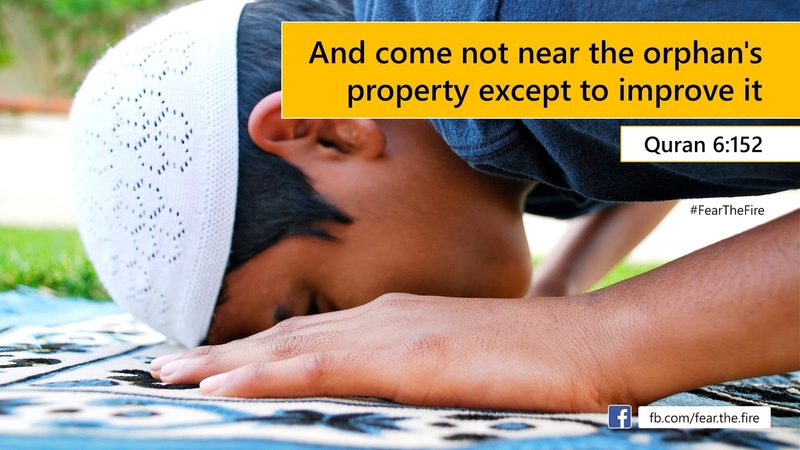 Quran 6:152 ~ And come not near the orphan's property except to improve it. 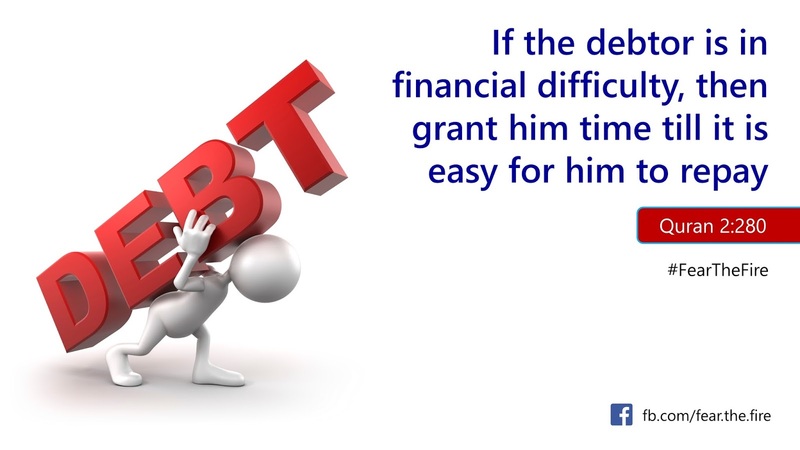 Quran 2:280 ~ If the debtor is in financial difficulty, then grant him time till it is easy for him to repay. 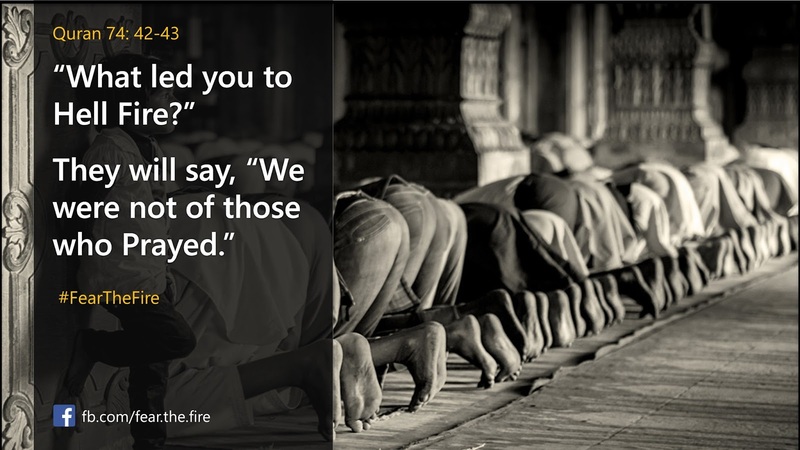 Quran 74:42-43 ~ (It will be said to them) "What led you to Hell fire?" They will say, "We were not of those who prayed." 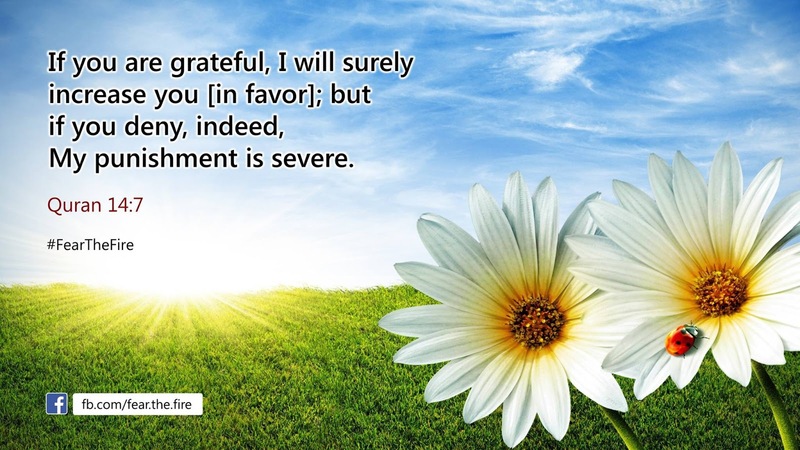 Quran 14:7 ~ If you are grateful, I will surely increase you (in favor); but if you deny, indeed, My punishment is severe. 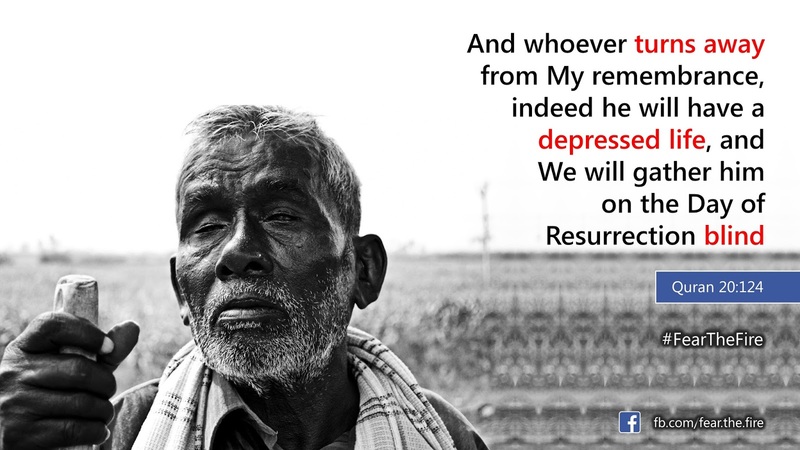 Quran 20:124 ~ And whoever turns away from My remembrance, indeed he will have depressed life and We will gather him on the day of resurrection blind. Failing to adhere to these basic fundamentals of Islam brings wrath of Allah and leads to trials, calamity and affliction on an individual or on a society. Check out the two reasons why Allah tests mankind.